Poor Jamestown Virginia-- the victim of poor colonial PR. How else can you explain that millions of Americans languish under the falsehood that the first colonists settled at Plymouth, Massachusetts? Truth is, Jamestown-- not Plymouth-- was the location of the first permanent English settlement in America (in 1607). In fact, they had a 13-year jump on those pesky Pilgrims. Want to learn the true scoop of the history of this historic site? Look below for a link to an excellent, short video that tells about the founding of the colony (look below for another video on the truth about Pocahontas!). How to get Jamestown discounts! With the focus on Jamestown's 400th anniversary in 2007, and archaeological artifacts being dug up everyday at the site of the original James Fort, there's been new info unearthed about the colony. For example, check out this YouTube video on the truth behind Pocahontas (it's NOT what you think, and it's a far cry from the Disney version!). And here's a link to an excellent, short video that tells about the founding of the colony. Which part of Jamestown Virginia is best for you? Run by the National Parks Service, this attraction is located on the original location of the colony. 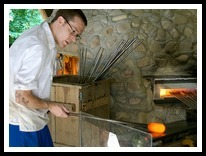 For all the details on visiting this historic attraction, click here. Right next door, but more visual, hands-on, a big more glitzy (and definitely more expensive) than its historic neighbor, The Settlement gives you the "living history" perspective of the colony. 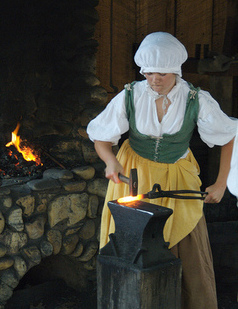 Talk to costumed guides in a replica of a Powhatan Indian village. Defend a replica of the fort from attackers. 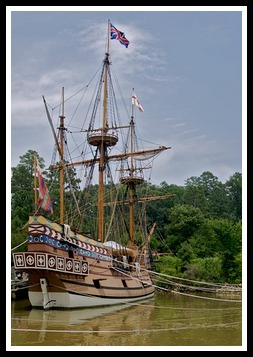 Climb on a replica of one of the ships that brought the colonists to the New World. Click here for tips on visiting the Settlement...and saving on admission. The Historic Triangle sights can get expensive, especially if you have a family of four or more. But there are ways to make your visit a little cheaper. For example, did you know that if you buy a ticket to Historic Jamestowne you can get into Yorktown Battlefield for free, and vice versa? If you're like most people, your visit to Jamestown Virginia will include a visit to one or more of the other fabulous local historic sights and attractions. Want to know how to visit Colonial Williamsburg, Busch Gardens, Great Wolf Lodge, Water Country USA, and other local attractions for less? Click here to learn how to get discounts on Jamestown and Yorktown. Click here for links to discount tickets for Busch Gardens Williamsburg and other local sights. Staying near Williamsburg? Here's the best things to do, plus how to save on food and hotels. And here are some of the best campgrounds near Jamestown and Williamsburg. Jamestown Virginia is one point on the "Historic Triangle" it forms with Williamsburg and Yorktown. Just a ten-mile drive along the scenic Colonial Parkway from Williamsburg, it's also a short drive (depending on the traffic...about 23 miles) from Yorktown. Keep in mind that at the height of the summer season, it can be slow (not slow by Los Angeles standards, but slow for Virginia). For round the clock traffic conditions, go to http://www.511virginia.org. So why not take advantage of the free Historic Triangle Shuttle bus? The Historic Triangle Shuttle provides service between Jamestown, Yorktown, and the Colonial Williamsburg Visitor Center. The service is available every 30 minutes between 9:00 a.m and 3:30 p.m. from April 1 to October 31. Riders can listen to an audio program describing the area’s natural and cultural history. Service is free of charge for ticket holders to any Historic Triangle attraction. Jamestown Virginia is located about a 30-minute drive west from Newport News/Williamsburg International Airport, about 1-1/4 hour west of Norfolk International Airport, and about 60 minutes east of Richmond International Airport. Both attractions are located adjacent to each other in Jamestown, right at the foot of the James River, and just before you get to the Jamestown-Scotland Ferry. Jamestown is just a short drive off I-64. If you're traveling from the Virginia Beach/Norfolk/Hampton area, head west on I-64 and then take Exit 242A. Follow Route 199 for five miles, then make a left at the fourth stop light onto Jamestown Road. Then go 4 miles south until you see the signs for the Settlement and Historic Jamestowne. Parking is free at both locations. 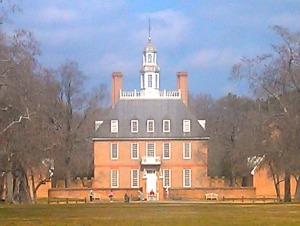 Historic Jamestowne address: 1365 Colonial Pkwy, Williamsburg. Historic Jamestowne phone number: (757) 229-9776. Here's a little side excursion from Jamestown Virginia (just a stone's throw from the Settlement) that we like to do whenever we're in the area. 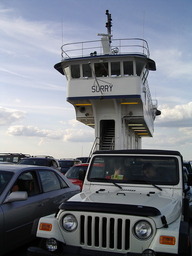 It's fun, it's free, and you'll get a beautiful, peaceful view of the James River. For all the details, click here.